As far as international groupings go, BRICS was always considered head-scratchingly strange: a disparate group of nations with very little to link them, whether it be geographical size, language, or form of governance. What Brazil, Russia, India, China, and the late entrant South Africa did have in common was a shared status as economies transitioning from developing to developed. But was that ever enough to keep this group afloat? Since the inception of BRICS in 2006, the bloc has been dogged by predictions of its imminent demise. But 12 years on, it is clear that BRICS is to be ignored or dismissed at peril, as it is shaping up to be a significant grouping – so much so that other developing countries wouldn’t mind being admitted into the club. More than ten years in, the bloc is starting to realise some of its early ambitions. By 2016, BRICS contained 41% of the world’s population, just under 30% of the globe’s territory, 23% of global GDP, and 18% of its trade. Against a backdrop of instability in the global world order, it is fair to say that BRICS is gaining currency and, potentially, influence. Last week saw the 10th annual BRICS Summit, held this year in Johannesburg, South Africa. For three days, leaders and representatives of the five members met to discuss how to best cooperate strategically and pragmatically in the face of their differences. 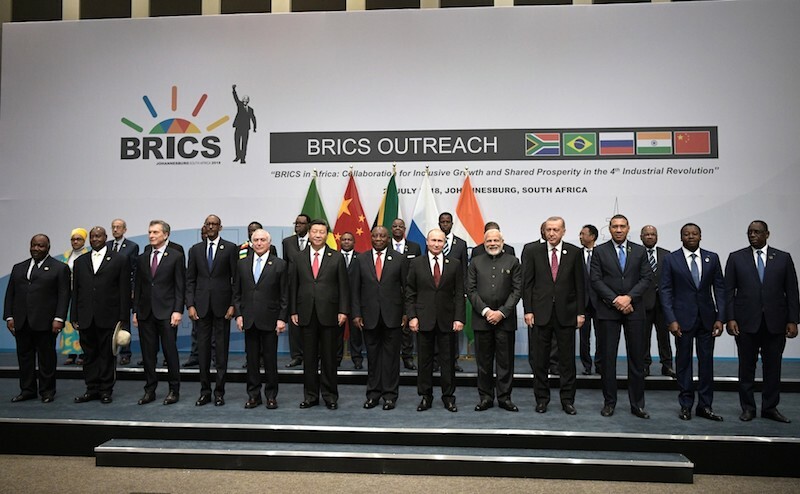 In particular, BRICS aims to boost multilateral trade, investment, and financial connectivity between developing nations – possibly, it might be said, to reduce their dependence on the West. The summit was watched keenly by the international community, eager to see China’s moves and words on trade in the face of the potential threat of a US-induced trade war over tariffs. Observers also wanted to see whether China would work to assert itself as the dominant state in the bloc whose members have, perhaps until now, enjoyed equal billing. The Chinese media might believe this is the case, with magazine covers such this one presenting President Xi Jinping towering over his counterparts, even Russian President Vladimir Putin. This Chinese magazine cover is revealing in how China sees BRICS, as well as the the positions of the five (for eg. A trade war should be rejected, because there will be no winner. Economic hegemony is even more objectionable, as it will undermine the collective interests of the international community, those who pursue this course will only end up hurting themselves. Later, Xi called for BRICS countries to support the multilateral trading regime and increase the voices of emerging markets and developing countries. His counterparts took heed. At the end of the summit, all leaders signed the Johannesburg Declaration, reaffirming their commitment to fight unilateralism and protectionism, pointing out the importance of an open world economy which would enable all people to share the benefits of globalisation, and calling upon World Trade Organisation members to abide by the rules and honour their commitments in the multilateral trading system. The declaration also reaffirmed the members’ joint commitment to cooperate on sustainable development, energy, agriculture, terrorism, climate change, international peace and security, and even an arms race in outer space. What will have more impact is China’s strategic spending on the African continent. Last Tuesday, Xi pledged US$14.7 billion in investment in South Africa, among other investments across Africa. South Africa returned the favour, pledging $300 million to China for a new metro line in the city of Luoyang, a gesture that Beijing no doubt appreciates. Indeed, lending between BRICS members is a key part of the bloc’s raison d’être. The New Development Bank, formerly known as the BRICS Development Bank, now has a lending portfolio covering 23 sustainable infrastructure projects totalling US$5.7 billion. These include roads and water supply provision in rural areas, energy projects, and more, emphasising the bloc’s commitment to developing countries. With efforts and sums such as these, it is no surprise other countries want in to BRICS. Last year, China invited a few guests of its own under the “BRICS Plus” banner, sparking speculation that Beijing wants to expand the bloc further. This year, several African leaders were invited as guests, including those from Uganda, Angola, Namibia, and Togo. At the same time, BRICS Plus was formalised, including representatives from Argentina, Indonesia, Egypt, Jamaica, Turkey, and the United Nations. From its indeterminate beginnings, BRICS has emerged as a significant global bloc: more than ten years in, it is starting to realise some of its early ambitions. What will be interesting to see as it progresses is what the group wants to do next. Does it remain focused on financial connectivity, or does it want to take a greater role in global governance? Is it content to allow China to take on a leadership role? And, importantly, will this bloc become yet another channel through which China will exert its influence? For a group that could provide a solid counter to Western hegemony, that would be a sad outcome indeed.